The tooth is bound in our mouth by our gum. Gum disease is the inflammation of this gum, and it can spread to the surrounding environment which supports the teeth. It occurs in three stages, and these are the gingivitis, periodontitis and advanced periodontitis (which is the most severe). 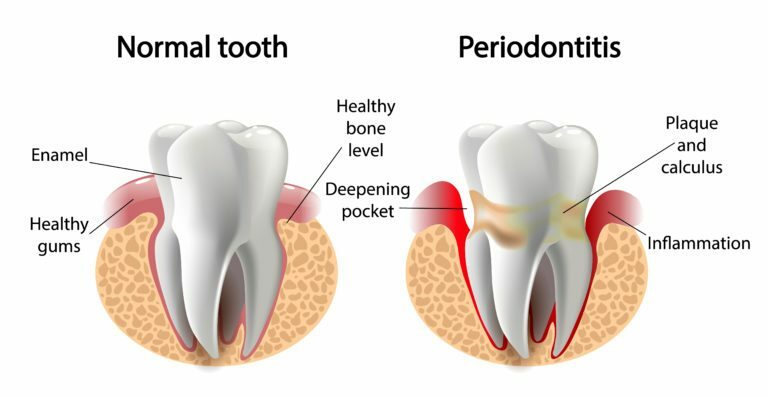 The advanced gum disease, which is also known as periodontitis, affects nearly half of adult Americans over the age of 30. This is from a recent report by the Centers for Disease Control and Prevention (CDC). Although a common condition, tooth loss is the often outcome if left untreated. However, there are many treatments available for it today. The first point of call in the treatment of periodontitis is a nonsurgical and conservative treatment which is called the scaling and root plan (SRP). Dr. Simpson will scrape and remove the plaque and tartar from the teeth and the root surfaces. He will also scale and smooth off any roughness found on the roots of the teeth to avoid bacteria or other particles from gathering there again. SRP may require multiple visits, and the use of anesthetics may be used in avoiding discomfort. As a result of this process, your gums will reconnect with the healthy teeth surfaces again after healing. Within some weeks, your dentist will run a check on you to ascertain your recovery and decide more treatment is required. If the gum does not stick perfectly, you might require a flap surgery for pocket reduction of periodontitis. This is done by folding your gum tissue, and Dr. Simpson can eliminate the bacteria and smoothen the areas of the damaged bone so that the gums can attach to the healthy bone again. The exposed roots, as a result of the recession of the gum, may be covered using gum grafts. This is done by removing gum from one area of either your palate or another source and could also be used to cover several roots of affected teeth. By covering the exposed root of your tooth, sensitivity is reduced and your tooth is protected from decay or rot, which can avoid any bone loss. Grafting of the bone is one of the few surgical procedures that promote bone growth in areas where the bone is been taken out or destroyed by periodontitis. During this treatment, Dr. Simpson will remove the bacteria, then go on to plant either a natural or synthetic bone in the affected area where bone loss has been experienced. He uses proteins which stimulate tissues effectively to help the bones and tissues regenerate. It is important to maintain a good oral hygiene to prevent and treat Periodontitis. Dr. Scott Simpson will recommend a plan so that this condition does not come back again. Contact us to schedule an appointment!